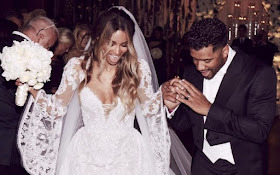 Ciara and NFL player Russell Wilson got married on July 6th and according to HollywoodLife.com, Future is very happy that his baby mama, Ciara is married and out of his life. The website said Future hopes the newlyweds go on a two year honeymoon so that they stay out of his life and Ciara stops making false allegations about him. “Future hasn’t sent her a gift, but he told his boys he should send her and Russell a check so they can go on a honeymoon for two years or more. That way, she won’t have time to try to smear Future’s name or cause a rift between him and baby Future,”. The insider adds that Future hopes Ciara will drop her defamation lawsuit.